Washington: NASA's Juno spacecraft has beamed back a stunning image of Jupiter, showing the gas giant's multitude of colourful, swirling clouds. The image captures a several bright-white 'pop-up' clouds as well as an anticyclonic storm, known as a white oval, in Jupiter's dynamic North Temperate Belt. The image was taken on October 29 as the spacecraft performed its 16th close flyby of Jupiter. At the time, Juno was about 7,000 kilometers from the planet's cloud tops, at a latitude of approximately 40 degrees north. 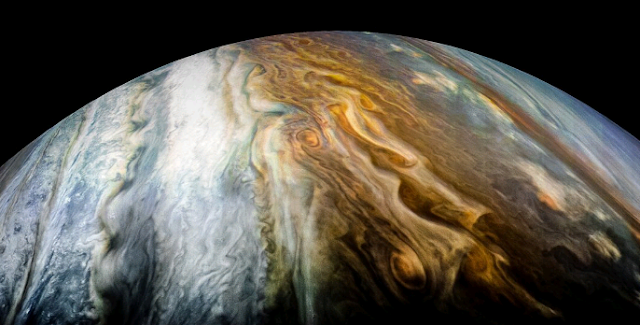 Citizen scientists Gerald Eichstadt and Sean Doran used data from the spacecraft's JunoCam imager to create a colour-enhanced image of the planet's cloud, NASA said in a statement. JunoCam's raw images are available online for the public to peruse and process into image products. As the primary example of a giant planet in the solar system, Jupiter can also provide critical knowledge for understanding the planetary systems being discovered around other stars. Data from Juno will help us understand how giant planets form and the role these titans played in putting together the rest of the solar system.